OVERVIEW: A teenage misfit named Hawthorn Creely inserts herself in the investigation of missing person Lizzie Lovett, who disappeared mysteriously while camping with her boyfriend. Hawthorn doesn't mean to interfere, but she has a pretty crazy theory about what happened to Lizzie. In order to prove it, she decides to immerse herself in Lizzie's life. That includes taking her job... and her boyfriend. It's a huge risk — but it's just what Hawthorn needs to find her own place in the world. 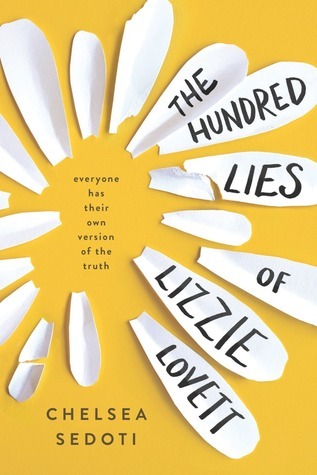 FORMAT: The Hundred Lies of Lizzie Lovett is a YA contemporary mystery novel. It stands at 398 pages. It was published January 3, 2017 by Sourcebooks. ANALYSIS: Have you ever wondered what it was like to be a stalker? You know one of those people who sees someone for a nanosecond and they become so obsessed with them they think of them day and night and start to become that person? If you answered yes, then this book is for you! The Hundred Lies of Lizzie Lovett was supposed to be this mysterious contemporary YA novel about a girl who goes missing while on a camping. Of course, the girl was loved by the entire city and was uber-popular, but one girl Hawthorn becomes obsessed with the case and is hellbent on solving it. Sounds like it has potential, but it sadly missed the boat. The book is filled with 95% of Hawthorne being an ultra-selfish, rude, insensitive person who doesn't care about anyone or anything. That is until she develops a borderline stalker attitude towards Lizzie Lovett – after Lizzie went missing. I understand people being upset about someone missing, but Hawthorne takes it to a whole new level. She had only talked to the girl ONE time in her entire life. In fact, she hated Lizzie and couldn't stand her. But when Lizzie goes missing Hawthorne is going to solve the case. How is she going to solve the case you ask? Well, she becomes Lizzie. Yes, she goes and takes the same job at the small diner as Lizzie, she frequents the places she went, walks around the campsite she went missing, and even starts dating Lizzie's boyfriend (who BTW is 25 and Hawthorne is 17). Hawthorne makes it her life to become and be Lizzie – because she believes she has this perfect life. While she is working on solving the mystery, Hawthorne gets this brilliant idea that Lizzie has turned into a werewolf (did I mention this book is a contemporary YA novel? If not, please keep that in mind because... it is important). Hawthorne doesn't just keep her theory to herself. She tells her brother, her parents, and even Lizzie's boyfriend. And it isn't like 'Oh maybe she was a werewolf", we are talking full researching werewolves, going on hunts, and honestly believing that Lizzie is a werewolf. The whole werewolf thing was just weird and out of place. I am not sure if it was some attempt at humor or some attempt at fantasy realism or what, but it didn't work. It just seemed like Hawthorne was immature and mentally unstable, and people like Lizzie's boyfriend just encouraged her by taking her on werewolf hunts and doing all this stuff to help 'find the werewolf'. I honestly thought that Hawthorne was going to turn out to be some mentally ill, bipolar individual. She was so all over the board with the things she would do. For example, she is upset that everyone is upset Lizzie is missing and she claims they shouldn't care because they hadn't seen her in a while. Jump forward a few weeks, Hawthorne is now obsessed with Lizzie's disappearance and she is upset that everyone has moved on. Another example is of her and her rather rude attitude towards her brother. She just said whatever popped in her head no matter how rude or insensitive it is. I couldn't believe someone would be 17 and not have one single ounce of care for anyone around them. Hawthorne didn't. There had to be something wrong with her. I will say that Chelsea Sedoti has a really good writing style. It is very conversational and it makes for a fast read. I just feel that this novel could have become so much more than it did. The mystery (which was non-existent) was boring, the ending of the book was unsatisfying, and the obsession with someone you barely knew was just odd. Maybe it would have been better if Hawthorne had been a little nicer, the mystery a little more mysterious, if the werewolf theory wasn't so front and center, or even if Hawthorne and Lizzie had been friends (either currently or in the past). But it wasn't and it just made for a weird read.